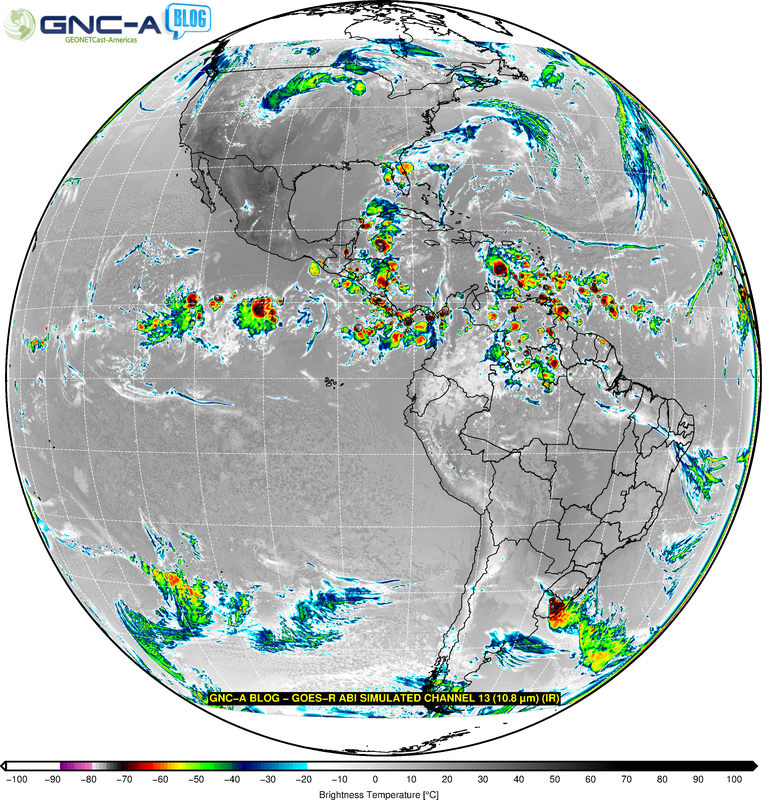 The image above was generated using a GOES-16 simulated image sample downloaded from the GOES-R official webpage. To generate this plot, three freely available software were used: GDAL, GMT and IMAGEMAGICK. In the Tutorials section of this Blog, you will find a 114 page tutorial on the usage of these tools (using GNC-A data). In this particular GOES-16 case, this simulated sample from the Channel 13 (10.35 um) was used. It is in NetCDF4, and has the same structure of the files that will be broadcasted through GNC-A. The script below shows all the instructions used to generate the image above. GDAL: Format conversion and image georeferencing. # [GMT] Multiply the pixels by 0.039071999, sums 173.14999 and subtracts 273.15 to convert to Celsius. # [GMT] Adds the shapefiles to the final image. # [GMT] Adds a text in the final image, according to the file "text_channel_13.txt"
# [GMT] Converts the post script file to ".png"
In this link, you may download the additional files used to run this script (shapefiles, blog logo, color table and text). This entry was posted in Products by Diego Souza. Bookmark the permalink.